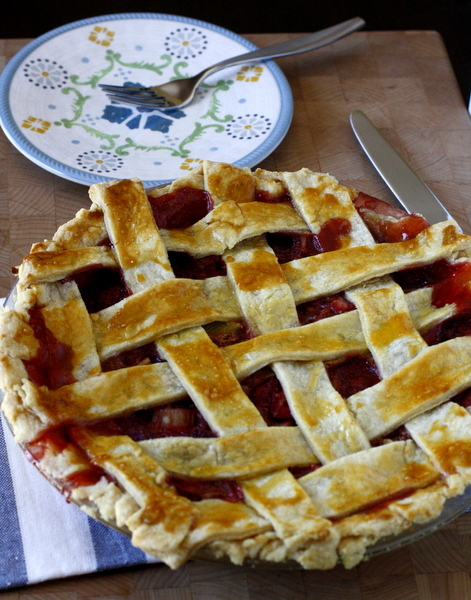 Would you believe this is the first time I’ve ever made strawberry rhubarb pie? And you can bet I will be making it again – it’s so good! I’ve always been a little wary of rhubarb since it’s so tart, but when Mike’s coworker brought some into work I decided to give it a try. 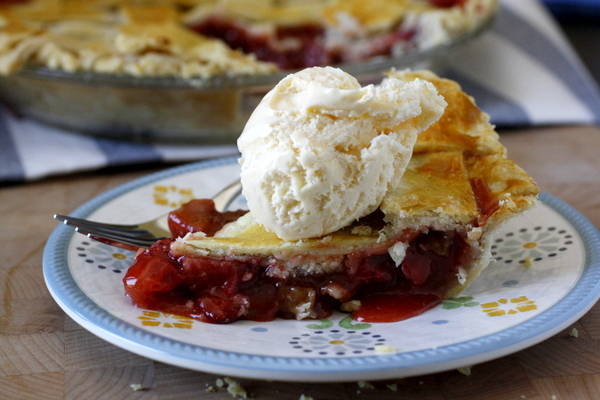 This strawberry rhubarb pie is simple and easy to make – it just takes a little prep time to make pie dough and cut the fruit. 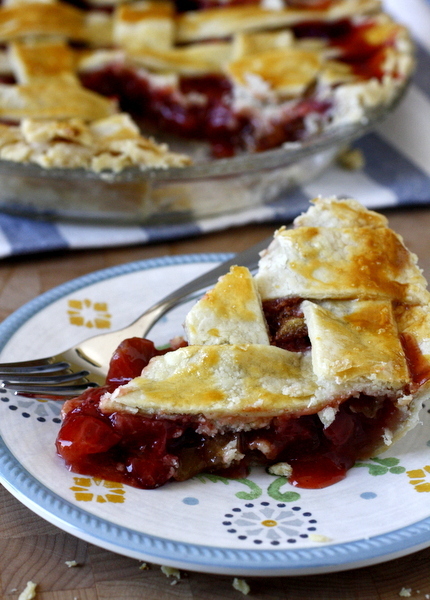 I used my old standby pie crust recipe from an old Betty Crocker cookbook, but feel free to use your favorite recipe or just buy a refrigerated crust to keep things simple. This is the perfect pie to make use of spring produce. 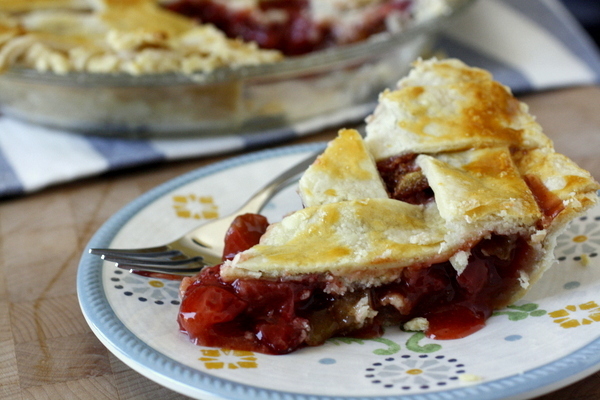 You can bet I will be making this strawberry rhubarb pie again and again – we loved it!! 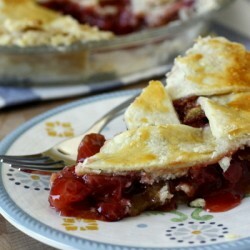 Make the filling: Combine rhubarb, strawberries, brown sugar, granulated sugar, cornstarch, cinnamon, and salt in a large bowl. Toss gently to combine. Roll out 1 dough disk on floured work surface to 13-inch round. Transfer to 9-inch-diameter pie dish. Trim excess dough, leaving 3/4-inch overhang. Spoon filling into crust. Roll out second dough disk on lightly floured surface to 13-inch round. Cut into 1/2-inch-wide strips. Arrange half of the dough strips atop filling, spacing evenly. Form lattice by placing remaining dough strips in opposite direction atop filling. Trim ends. Fold edges of dough under, pressing to seal. Make the glaze: Combine the egg yolk and water in a small bowl. Brush over crust. Transfer pie to the foil-lined baking sheet. Bake 20 minutes. Reduce oven temperature to 350°F. Bake pie until golden and filling thickens, about 1 hour 15 minutes, checking after 45 minutes to make sure the pie isn't getting too brown. If it is browning too quickly, tent with foil.